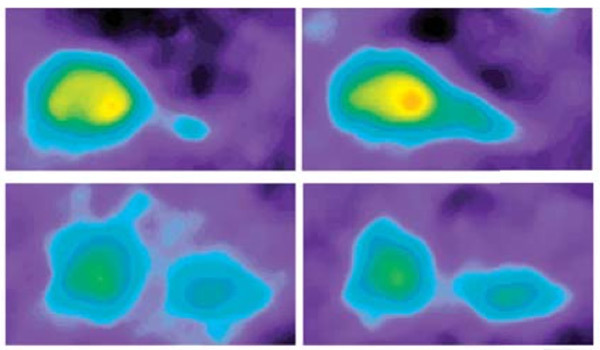 Sensory overload: BTBR mice’s (bottom) response to sound (left) is stronger than that of controls (top), but their response to sound and touch together (right) is significantly suppressed, suggesting that they use touch as a coping mechanism. Mice modeling autism have trouble integrating different kinds of sensory information such as sight, sound and touch. A study published 31 July in Neuron reports that an imbalance between signals that calm neurons and those that excite them leads to these sensory problems1. The researchers presented preliminary results from this study at the 2012 Society for Neuroscience annual meeting. They reported then that the anxiety drug diazepam, first marketed as Valium, helps the BTBR mouse model of autism integrate information from multiple senses. The new paper extends this finding to three other models of autism. It makes a strong connection between signal imbalances early in the brain’s development and problems with sense integration later in life. “We find there is probably a sweet spot for development of an excitatory-inhibitory balance that allows multisensory integration to happen properly,” says lead researcher Takao Hensch, professor of molecular and cellular biology at Harvard University. In mice, that sweet spot is in the first few weeks of life, the study found. The brain consolidates information gathered by multiple senses: For example, it integrates the sounds of someone talking with the person’s mouth movements. People with autism are known to have trouble with this sort of multisensory integration2. Many people with the disorder are extremely sensitive to sound, touch and other sensations. This can make it difficult for them to function socially — for instance, by causing them to cover their ears at loud social gatherings. The researchers looked at brain activity in BTBR mice, a commonly used autism model that shows social deficits and compulsive grooming, a stand-in for the repetitive behavior seen in people with the disorder. They focused on a hub for sensory processing called the insular cortex. This region, located deep within the cerebral cortex, is involved in interpreting other people’s emotions, processing body sensations and regulating the body’s internal state — which includes maintaining the correct temperature, pH and water and salt balance. It also coordinates the brain’s ability to switch from task to task3. “We are convinced that it is really an important region in the brain and understudied in autism,” says Lucina Uddin, associate professor of psychology at the University of Miami, who was not involved in the new study. Her team has shown that activity in other brain regions affects the insular cortex, and these patterns look different in children with autism than in controls. The new study looked at the insular cortex in mice. In controls, a puff of air on the front paw and a sound tone each cause neurons in this region to fire, and their combined signal is greater than the sum of the individual responses. This effect is evidence of sensory integration, Hensch says. In contrast, the BTBR mice’s response to sound is stronger than that of the controls, but their response to sound and touch together is significantly suppressed. This suggests that touch is a coping mechanism for these mice, Hensch says. For example, when they hear a loud, stressful noise, grooming might soothe the overexcited signals and help the mice calm themselves. In the first few weeks of life, the BTBR mice and the controls both respond strongly to sounds. The control mice then gradually pare back their response as they age, whereas the BTBR mice continue to show this pattern well into adulthood. This may be the result of having too little GAD65, a protein involved in the production of the neurotransmitter gamma-aminobutyric acid, or GABA, which prevents neurons from firing. Low levels of GABA could tip the brain into an overly excitable state. Giving BTBR mice diazepam when they are 15 to 28 days old amps up GABA signaling and helps calm brain activity. These mice now show normal sensory integration patterns in the insular cortex and groom normally. “That multisensory integration patterns could be recovered is absolutely fascinating,” says Sophie Molholm, associate professor of pediatrics and neuroscience at the Albert Einstein College of Medicine, who was not involved in the study. However, the drug has no effect in adult mice, suggesting that the window for improving sensory integration is early in life. The researchers looked at three other mouse models that also show signaling imbalance in the brain: mice lacking GAD65; mice with deletions in SHANK3, the gene mutated in Phelan-McDermid syndrome; and mice lacking the Rett syndrome gene MeCP2. The first two have overly excitable brains, whereas the last has too much inhibition in the brain. All three of these mouse models have trouble integrating sound and touch, the researchers found. This suggests that an imbalance of signals in either direction — excitation or inhibition — can cause problems, Hensch says. That the researchers tested their theory in multiple mouse models is key, says Stacey Rizzo, associate director of the Mouse Neurobehavioral Phenotyping Facility at Jackson Laboratory in Bar Harbor, Maine. BTBR mice mimic the behavioral traits of autism but don’t have an autism-linked mutation. Finding the same result in mice with autism-associated mutations strengthens the work, she says. This describes my son to a T. Since I can’t get into his head to see what he is experiencing, I believe he had trouble regulating sound volume. He also seeks deep pressure so his sense of touch is askew. I wonder how this is all tied to gut microbiome which is found to be different in children with autism. Could the gut flora be impacting the level of GABA and hence the signaling in the brain preventing proper sensory intergration? Is the insular cortex damaged or is it just a signaling problem in the autistic brain?